I just returned from the annual convention of the National Speakers Association. This is always a special time for me. I get to meet with my friends and peers and discuss trends and issues that we all face. 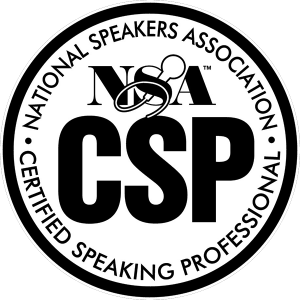 This year is very special because I return as the President of the National Speakers Association. Walking in the halls you never know whom you’ll run into. Maybe you’ll sit next to Zig Ziglar at breakfast, chat with Mark Victor Hanson of Chicken Soup For The Soul fame, or be in a break out session with Bob Danzig the former publisher of the Hurst Newspapers. Everyone comes together to share, learn, and grow. There is time for fellowship and education. In the end we go back home to our families and businesses rejuvenated in mind and spirit. Each year after my convention I come home and review my business plan. I look for holes. I also look for ways to incorporate ideas I’ve learned, so I can expand my business. When I look back at the people that I have met and the ideas that they have shared with me, I can add up tens of thousands of dollars that I have earned as a result. Vicarious learning is the least expensive and fastest way to learn anything. Learning from others is what accelerated achievers do best. Japanese companies use ideas they learn from companies in other countries to greatly shorten their learning curve. You can too. Many times business professionals make business plans that include growth projections but don’t take the time to calculate the added knowledge they will need to meet these new goals. Ultimately we are each accountable to gain the mental as well as the financial resources necessary to achieve what we desire. Goals are great, but expertise and continuing education will help you build your business. Are you accountable for your continuing education? What steps are you taking to further your career? Do you have a continuing education program? Do you budget money each year to further your education, expose yourself to new ideas, and add to your networking circle? This is a must. All industries have trade associations. Some industries have more than one. Join your trade association, but don’t stop there. Go to the meetings and get involved. Joining on a local level is good, but it’s imperative to also join nationally. When you are an active member of a national association you will meet people from all over the country that have the same challenges, pains, and business issues as you. Many of the people will share their successes with you, and you can share with them. National meetings are great for networking within your industry and building relationships. Once you build relationships you will have other people you can turn to when you are faced with challenges. Surveys show that the two main reasons people attend meetings is for education and networking opportunities. What is the value of one new idea? What would it be worth to you to be able to turn to an expert in your field with questions and issues you’re facing? I estimate that it costs about $1,200.00 to attend an annual meeting. The cost of attending an association meeting varies. You can get the exact data from your trade association. I’m big on Mastermind Groups. My Mastermind has been meeting every month for the past nine years. All of the members are people I met in my trade association. We get together once a month and share our victories and our challenges. We help each other market, deal with personnel problems, and build our businesses. Over time we have become accountable to each other. No one wants to show up at a meeting and not have completed what he/she has committed to the month before. In our Mastermind Group we review each other’s financial statements and look for areas of concern. We share our strategic thinking and planning. If someone needs help writing copy for a sales letter or brochure we chip in. I know of Mastermind Groups that have members from around the country. Each month they meet on a conference call. The call lasts about two hours. During the conference call they deal with many of the same issues I deal with in my Mastermind Group. Whether you are local or spread out all over the country, a Mastermind Group is the most powerful way of putting your business in the fast lane for growth and prosperity. Maybe there is one area of business that you need a little help with. Some business people are not as strong with the financial areas of their business and might consider taking an accounting course. Many people would make better sales professionals if they could be a more effective presenter. A communications course would be great for them. If you have employees, maybe there are some management issues you could bone up on. When we’re done with school we think that it’s time to make it in the “real” world. The reality is that school never ends. We must continue to be educated and grow. My father is 87 years old and he still takes a course at the community college on a regular basis. Do you have a weakness? Is there a course that would be of help for you? What additional education would help you move your career or business successfully into the future? Expertise is developed over time. Experience, knowledge, and competency all add to creating expertise, and increased expertise leads to superior results. Ninety-five percent of all the people in the United States have not read another non-fiction book since their last day of formal education. Professionals who want to get to or remain at the top of their field must continue to read and study in their area of expertise. What are you reading? Do you spend time researching in your field? If you want to build your business and your bank account, then you have to be build your expertise. Networking and continuing education are essential for business professionals who want to excel. If you’re looking to be average, then just do average things. If you are looking to be at the top of your industry then don’t settle for average. Be patient, consistently work at your knowledge base, and develop relationships. Now you’re on the road to Building a Better Biz!